The Society was first formed in September 1992 in Dreghorn Church Hall with 28 people who were interested in singing. The choir was formed by Andrew Young and Catherine Mair with Jim Grant as accompanist. The first concerts were held in Dreghorn Church Hall on 27th and 28th April 1993 and since then has performed at a variety of venues and occasions. In January 1996, we performed with Anne Lorne Gillies at Ayr Town Hall, in a concert to celebrate 100 years of the Salvation Army in Ayr. We have also been involved in ceremonial services in several churches and staged concerts in the Racquet Hall at Eglinton Park. Our two main concerts now take place in the Grand Hall, Kilmarnock in May and December every year. Each Musical Director brought their own particular style and personality to the post and we are grateful that they have taken the Choir to new levels. The membership of the Choir began as 28 and now is around 90 singing members. 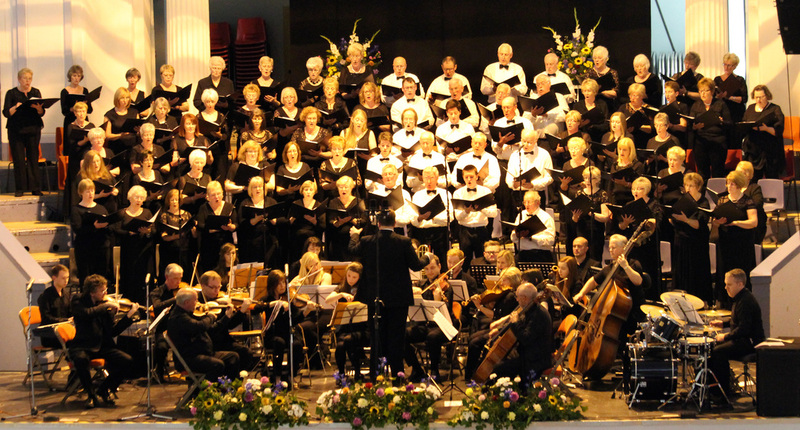 Dreghorn Musical Society is a non-profit making organisation and has always endeavoured to donate to charity. Many charities have benefitted, as the total donated to date is around £44000. We hope to be able to continue to donate to charities, particularly those helping local people.